Yesterday I discussed the Chakras on my A1R Psychic Radio Show, and how they relate to psychic development. As you may know, there are many layers to the Chakra System and we can work with these beautiful energy centres to stimulate different aspects of our lives including spirituality, long term vision, self-expression, personal power and confidence, appetite for life and core foundations. We can also use Chakra meditations and energy healing to unlock our intuition and psychic abilities. Next week I intend to go through a meditation that we can use to flex our Chakras, for now I thought it best to lay the foundations with a bit of theory. And yes, we can all unlock these gifts! I learned to develop my intuition by healing and stimulating the Base Chakra and working my way up slowly, even though the upper Chakras are traditionally associated with clairaudience, clairvoyance and intuition. If you're new to psychic development and are excited by the possibility of seeing angels, spirit guides or receiving clairvoyant images, you may be tempted to start with the Brow Chakra. Please consider this approach too, as it is likely to pay off big time in the future. The Root (or Base) Chakra: Located at the bottom of the spine, this beautiful red Chakra connects us to Mother Earth, providing a sense of grounding, comfort and joy in our physical surroundings. A healthy Root Chakra enhances our sense of grounding: picture an energetic chord extending down from your spine into the Earth. The deeper it goes, the stronger and more robust your energy will be, making it possible for you to channel powerful energy and insights without toppling over or burning out. Deep grounding also makes it possible for us to receive timely messages that are detailed enough to be actionable. The Root Chakra is our subconscious link to the physicality around us, including obstacles, events and surprises. Deep grounding also brings your God-given, creative energy to Earth. The Sacral Chakra is often seen as orange in color. It is located in the lower abdomen and is our subconscious link to the magical albeit confusing world of human emotions. A healthy and open Sacral Chakra makes it possible for us to feel and express our emotions, though it can also overwhelm us with other people's issues. Empaths will recognise this phenomenon, and it is one of the reasons why it's so important to ground, clear and protect your energy. We want to be there for our loved ones without feeling their emotions so intensely, and many empaths carry extra weight in this area to add a physical layer of protection. During psychic readings however, it is important to tune into the sitter's energy field and the Sacral Chakra makes it possible for us to get a sense of what they're going through. The Sacral Chakra also plays a very important role when it comes to shaping the future. We may receive all sorts of information, visions and ideas from our intuition but without a strong Sacral Chakra, it will be hard for us to channel that vision into the physical world. Having strong grounding (Root) and an open, active Sacral Chakra will help us make our dreams a reality. This alone is reason enough to work on our lower Chakras. It will give our presence more oomph, more power and more creativity. Of course, a strong Solar Plexus will also give us the confidence to make it happen. The Solar Plexus Chakra is located in the upper abdomen and it relates to our sense of self, our likes, dislikes and personal power. Having a strong and clear Solar Plexus will give you a better sense of who you are, what you stand for and where your boundaries lie. It may also give us a nudge if we're sacrificing our integrity to please another. It's also known to be our psychic alert system. You may get a sense that a particular situation isn't right or safe for you. Our Solar Plexus can let us know when we need to distance ourselves from a person or situation, though our fears and beliefs can also trigger false alarms. If you're ever in a situation where you don't know who (or what to trust), bring your attention up a notch to your Heart. The Heart Chakra is known as the seat of unconditional love. It is the bridge between our lower and upper Chakras, integrating the information received from the physical world through the Root, Sacral and Solar Plexus with messages of love and divine guidance, typically accessible through the Throat, Brow and Crown Chakras. It can be helpful and empowering to ground from your Heart Chakra, sending a grounding chord from the Heart, down past the Root and into the Earth. This can make it easier for us to experience life and react to challenges from a place of love and trust, instead of fear. The Heart is also connected to our Higher Self or Soul. Check in with your Heart when you're looking for quick intuitive guidance on your life. 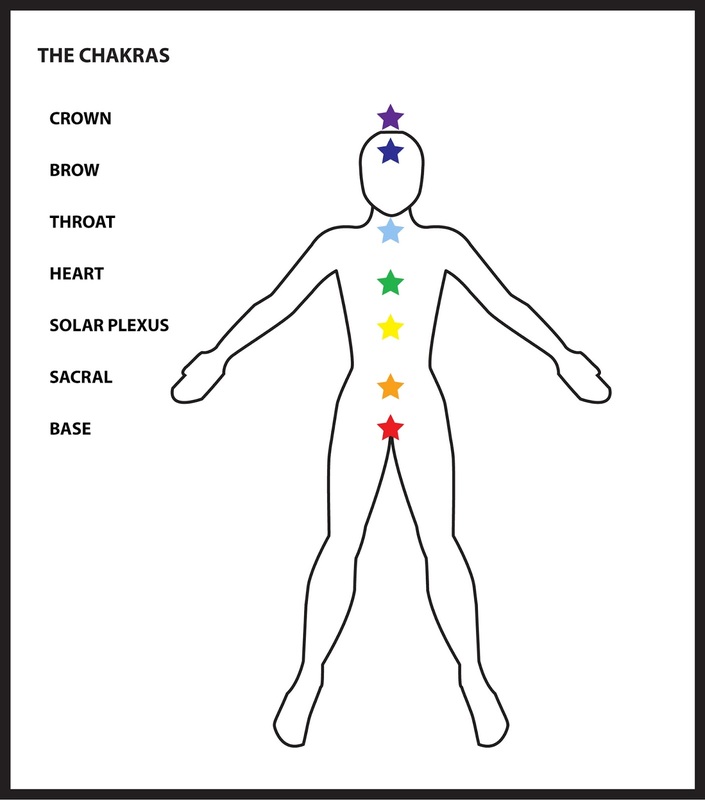 Once these four Earthly Chakras are strong, active and healthy we will have the energetic and physical foundations to channel information through the Throat, Brow and Crown. Those of us who are naturally oriented towards the upper Chakras may need to spend more time on the Root, Sacral and Solar Plexus so that we can give them a chance to catch up. Once this solid foundation is in place, you'll be able to access your intuition and channel it into the real world. How exciting! The Throat Chakra is blue in color, linked to clairaudience. 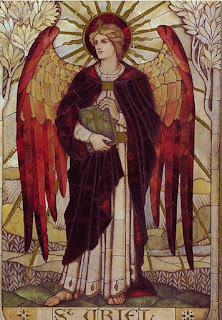 It governs communication and self-expression, whether we are communicating with our friends, family, angels or guides. I have always experienced my Throat Chakra like a little speaker in my voice box, and the loudest voice tends to be my own Inner Voice. When you let your intuition speak through your Throat you'll receive insights from your physical body, your angels, and spirit guides. Our spirit helpers tend to speak to us in our thoughts, so if your mind is going 100 miles an hour it can be hard for them to break through. Mindfulness and meditation create quiet space for intuitive guidance to appear. The trick is to act on the guidance, keeping mind that ultimately you are responsible for your actions and their consequences. If the "guidance" makes you feel uneasy, just ignore it and ground, centre and protect yourself. The mind can play tricks on us, telling us what we want to believe or what we're scared of. Intuitive guidance is usually timely, helpful and it feels like a stroke of good luck or a blessing when we receive the word. 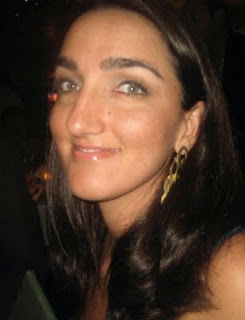 The Brow Chakra is one of the most exciting because it opens the door for clairvoyance to come into your life. This Chakra is usually seen as indigo in color and I would recommend letting it open up when it's ready to. It's not the only way to receive guidance, keep in mind that there are seven psychic abilities and only one of them is related to sight so you'll still receive information as words, hunches, emotions, tactile sensations and even taste or smell. For me clairvoyance has always been a game of Pictionary; my Mind's Eye will show images, pictures, cartoons, tarot cards, symbols or even scenes from movies and it's up to me to figure out what it means. If you receive a message for someone else it's good to tell them exactly what you saw because the image may have significance. For example, I once gave a classmate a clairvoyant reading about a book she was writing and the last image was a lighthouse. I had no clue what it meant, but she identified the lighthouse as one of the potential cover designs. It resonated with her even though I had trouble explaining the image. 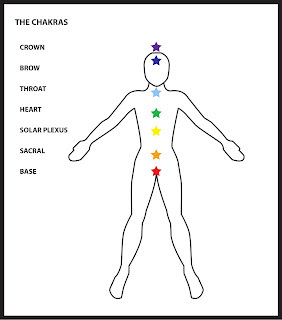 The Crown Chakra is located at the top of the head, you may feel your scalp tingling when it opens. This is where we draw in light, love and intuition from the Universe. When we channel healing or messages they enter our consciousness through the Crown, and travel down our central column through the Brow Chakra where they may manifest as images, or the Throat where they take the form of thoughts or words. This light and knowledge can also reach the Heart Chakra and that's when we just know something. I like to draw on that energy and bring it all the way down to the Root Chakra so that I can work with it on a physical level too. Psychic and intuitive work involves clearing the path for these energies to flow freely along our central column to all of our Chakras, grounding, clearing and protecting ourselves with love and light. There is another component to intuitive and energy work that I haven't touched on today, which is the Aura. Each of these Chakras has it's own Aura layer, and we can also receive information by activating our Aura and amplifying our listening skills. It's really important to close down by clearing and protecting our energy when we're done meditating, otherwise we may get a lot more than we bargained for. I hope this introduction to the Chakras was helpful. If you'd like to start practicing I would love to recommend Elliot Jay Tanzer's Guided Meditation for Grounding, Centering and Claiming Your Space. It's one of my favourites, lasts 29 minutes and once you've learned the steps you can easily go through them on your own while you're out for a walk, etc. Subscribe by email below to get updates, thanks! Try My New Chakra Meditation!